Tip: Syringe feeding was the first method of assisted feeding that I learned. This method works well, especially for cats that bite or have really, really sharp teeth. Some cats do better with what I refer to "Finger Feeding" and you can sometimes actually get more food in them per feeding session. It's a little more personal, too and your cat may respond better than accepting food with a syringe. Work with both methods of syringe feeding and finger feeding to see which works best for you and your cat. Having the most stress-free session as possible. There are quite a few options when it comes to assist feeding syringes. The type and size of syringe that you choose to use is a personal decision. Experiment and find the one that is right for you and your cat. 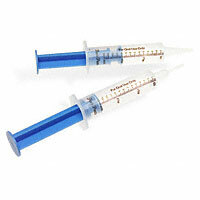 Rubber Tip plunger - This is the type of syringe your vet will most likely give you to get started. You will find that you can only use these syringes a few times before the plunger sticks and dangerously shoots uncontrolled amounts of food into your cat's mouth. Fat in the food reacts with the rubber and causes it to get gummy and stick. The higher fat content in your food, the faster the rubber will degrade. View this type of feeding syringe as a disposable and only expect to get one or two uses out of them so you don't get frustrated. Silicone Ring plunger - I don't have a picture (if you do, please email to kathy (at) assistfeed.com). It looks like a plastic tip plunger but it has a silicone ring just before the tip that helps the plunger glide smoothly. I think you can find these at bird supply stores. I'm not sure about the available sizes. Plastic Tip plunger - The plastic tip doesn't have the trouble of sticking like the rubber tip. You will be able to reuse this type of srying over and over again. Small Feeding Syringes- Some people like to use 2ml up to 6ml syringes because of the shape and feel, and the ability to better control squirts. These small syringes require multiple reloadings or better yet... prepare several syringes to get enough food for one feeding. Drug stores and pharmacies have 5ml oral medicine syringes for children's medicine. Some stores will just give one to you if you ask. They will either be the rubber plunger type or if you are lucky, the silicone O-ring which will last longer. Medium Feeding Syringes - The vet will probably give you a 12ml syringe. This is the most common size. Large Feeding Syringes - 35mm are even available but I had trouble handing a syringe this large. If you find that food gets clogged in the tapered tip syringe, you may need to cut the tip to make the opening bigger. Use a sharp knife and a cutting board (don't use scissors - you won't get an even cut). The freshly cut tip will have sharp edges so be sure to smooth out any sharp places by rubbing on a wooden cutting board or by using a very fine fingernail file works. Make sure there are no sharp edges by rotating the tip on your cheek or on the soft skin inside your elbow... gotta be sure! :-) Be sure to cut just a little at a time and try it out before cutting too much off! Also, you want to maintain enough of the tip so that the tip still fits into the side of your cat's mouth easily. Thanks to Amy V. for sharing about Pigi's story and for sharing about the syringes she buys from CVS Pharmacy. NOTE: The company that made these syringes isn't showing them on their website anymore so they may be in short supply. These syringes are washable and reusable hand feeding syringes that hold up to 1/2 ounce (0 22 mm) each. PetSmart carries them in the Cat section with the supplements and milk replacement products. Buy 2 kits. Notice that the tips are different. The tapered tip on the right will be used for assist feeding. You can cut the left one off at the first notch and preload your food then transfer to the tapered one during feeding. Load the syringe by spooning food in from the top of the syringe... a popsicle stick works great and helps to get the air spaces out, too. Some syringes come with a little funnel that help as long as the funnel has a wide opening. Depending on the consistency of the food, you may be able to draw the food up through the syringe. WARNING: For most standard foods, I have found that to be able to draw the food up with the syringe, the food must be watered down... meaning that the food has less calories. In most assisted feeding cases, we are trying to get the maximum amount of calories in our kitties, so please don't water down the food unless instructed to do so by your veterinarian.